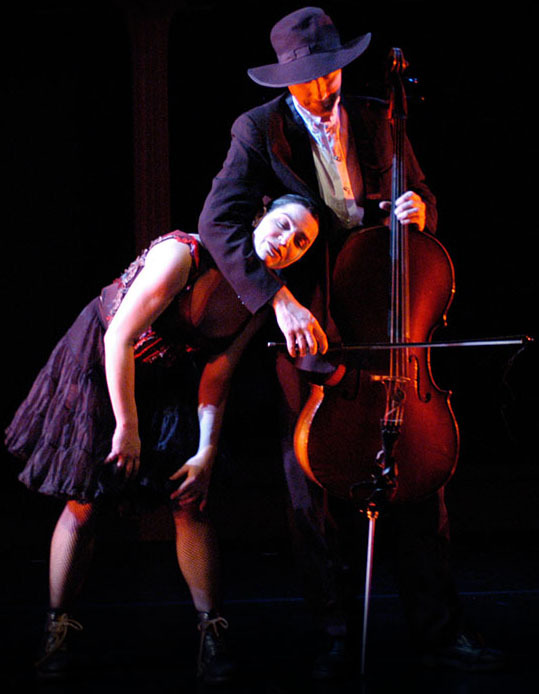 Known throughout the country for the unpredictable and beautiful way the dancers and musicians flawlessly and often humorously interact in performance, Rebecca Stenn Company was founded in 1996. Since its inception, the company has toured to over 50 cities in the US and abroad, performing, creating commissioned works and holding residencies. The group is devoted to bringing together new music, rock, jazz and classical with evocative, athletic dance to create distinctive pieces that challenge the ways these two mediums interact. The company is made up of four dancers and three musician/composers. This combination of performers allows the group to explore the boundaries of collaboration by experimenting with blurring the distinctions between the two mediums. The company comes from the MOMIX, Pilobolus tradition, but carries on the lineage in groundbreaking new ways. For the past 18 years, the Rebecca Stenn Company has also been committed to residency and outreach programs and to working with the community at large in educational settings, and the company looks forward to continuing to take part in many outreach programs both nationally and internationally.